This is our frequently asked questions page, explaining all about thread veins (spider veins) on the face and treatment via the process of thermo-coagulation. 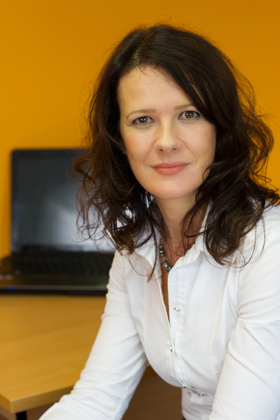 To find out more about Sarah’s specific approach you may wish to visit our treatment page. Thread veins, also known as spider veins (or telangiectasia to give them their medical name) are thin veins, close to the surface of the skin, which have become enlarged, and hence visible and unsightly. Usually there is no one single cause, which perhaps explains why they are so common. They can develop more with increasing age, and can often be associated with hormonal changes (which is why women can be more prone to them than men). It is thought that there is a hereditary tendency towards thread veins, but other environmental factors such as exposure to sun, exposure to extreme wind or temperatures, and certain medications are all thought to contribute/aggravate the condition. They are also associated with skin conditions such as rosacea and acne. Thread veins are not dangerous but they can become more prominent and cause greater cosmetic concern over time. When should they be treated? Ideally thread veins should be treated as soon as possible, as they have the potential to develop further, and become more difficult to treat in time. Thermo-coagulation is a process whereby a small burst of energy is delivered, through an insulated needle, directly into the vein. The heat from this energy causes the blood in the vein to coagulate (solidify), which in turn causes the vein to collapse, as shown in the graphic below. The tiny collapsed vein is then absorbed by the body, with no after effect. Unlike other treatments, the procedure targets the individual veins themselves, rather than the surrounding area. 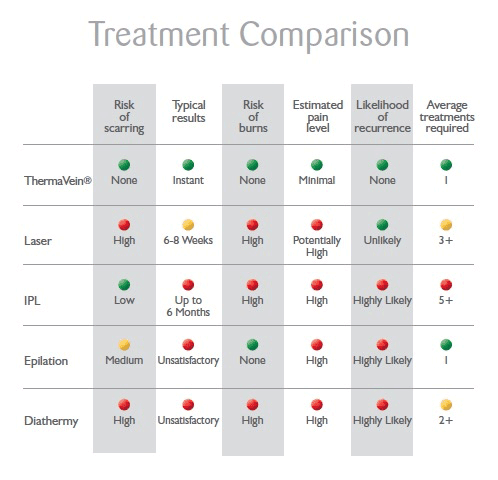 Yes – ThermaVein (also known as Veinwave) treatments have been safely performed thousands of times, all over the world. Unlike laser or IPL, it targets only the specific veins, rather than generalised areas, meaning there is minimal risk of damaging neighbouring tissue. There is a stinging sensation, not unlike a hair being plucked, though how noticeable this is will depend on the individual patient, and the area being treated. Anaesthetic creams are not to be used, but there is no restriction on the use of simple painkillers (such as paracetamol). There will be initial redness in the treated area, but this should quickly fade on the day of treatment. On the second day very small scabs might develop at the points of contact, but these would typically resolve within a matter of days, generally up to a week at most. A concealer can be used on the scabs from the day after treatment, if required. Aftercare is minimal. You will be supplied with a calming cream to apply during the first day or two. Some patients find the cooling effect of aloe vera gel to be also beneficial in the days following treatment. Use of a broad spectrum sun cream is obligatory. Is there anyone who should not undergo ThermaVein/Veinwave treatment? It is not advised for pregnant women, or those who suffer from epilepsy, or have a pacemaker. In many cases one treatment would be sufficient. In more severe cases a second (and even third) treatment may be necessary, but this would be assessed at your routine follow-up appointment, approximately four weeks later. Although the vein is permanently destroyed, over time new veins can develop, which would need treating when necessary. How long does treatment session last? It is not recommended for any treatment session to persist beyond fifteen minutes, as extended treatment would run the risk of causing trauma to the skin. How does it compare to other treatments for thread vein removal? All initial consultations for thread vein treatments, to assess suitability for treatment, are with Dr Sarah Norman. These are free and without obligation. If treatment is deemed suitable, and you wish to proceed, this is offered by both Sarah (at £300) and Julie/Natasha, our fully-trained Aesthetic Therapists (at £200). You will be given a 30 minute treatment appointment in total, which will include 15 minutes of thermo-coagulation.